I met Eileen for a shoot all about her kitchen and had to share a few outtakes and images from the rest of her pad in Venice Beach, California. Just look at this place and this babe of a soon-to-be Mama . . . We had a magical afternoon while Eileen prepared some of her outrageously addictive granola, which she may start selling at a friend's shop (she should, this stuff is the manna of the crunchy/sweet/salty nosh!! ), a super easy shoot then she showed me around her home for a peek into her world. Eileen and her husband Mark have only lived in this heavenly rented space for 1 years, but they've managed to make it their own with some lovely, attainable details. 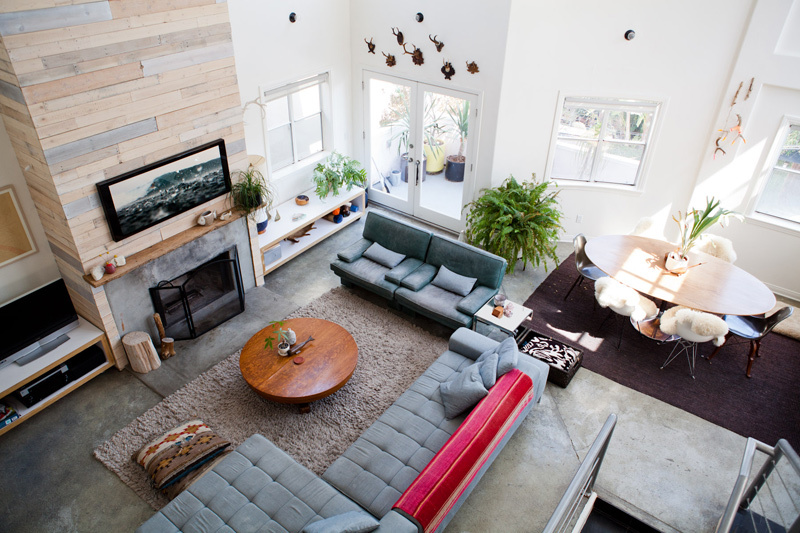 The fireplace is covered in palette boards Eileen whitewashed to have a driftwood, ocean vibe, there is the most glorious succulent festival going on within their rooftop garden where they grill dinners galore and check out their library constructed from plywood!